I love doing crafts and projects with my son! He also loves to match animal flashcards, trace his letters and color lots and lots of pictures!! The only problem that I have is that I have no way to save them or preserve some of his best work or his flashcards so he can use them over and over again! Once he uses them a couple of time, they get crumpled, bent or ripped and I am forced to throw them away. I have always wished for a laminator more times than I can count and recently MyBinding.com became my fairy godmother and granted me my wish!! MyBinding.com is an Oregon-based family-owned company. They specialize in binding machines and supplies, laminators and supplies, 3-ring binders, whiteboards, and so much more. Their large warehouse space is full of products ready for immediate shipment and they offer free shipping on all orders over $75. MyBinding.com also staffs a customer service department, ready to answer questions, recommend products, take orders, and anything else you might need. I generously received the awesome GBC 9" Creative Laminator which is specifically designed for home, school, or small office use, and has the great quality GBC brand behind it! This laminating machine offers a 9" wide throat that is designed for use with 3 MIL and 5 MIL laminating pouches that are up to 8.5" x 14" (legal) size. 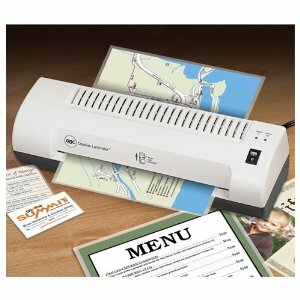 The best part about the GBC 9" Creative Laminator is that it is economical making it a great option for a home user who wants to create craft projects, signs, bookmarks, placemats, drink holders, luggage tags, ID badges and stickers. I love how small and economical this laminator is so I can fit it in our craft corner without taking up a lot of room. However, it does a great job laminating all my letter sized projects including my son's artwork, signs I make, educational materials, recipes and pretty much anything I want preserved and protected! Thanks for all that entered the giveaway! As a special offer for all my followers, MyBinding.com wanted to make sure everyone who wanted a laminator gets the opportunity! They are offering the Badge Laminator Id Kit and the 4x6 laminating pouches (20pk) at a special price of $9.99 for the laminator (limit one per customer) and the pouches for $0.89. These awesome special offer prices will expire on June 22nd! Win It: MyBinding.com is generously offering (1) GBC 4.5" laminator to a lucky winner! I entered the 2 oz Bottle of the Neilsen-Massey Organic Madagascar Bourbon Pure Vanilla Extract!